My first colonoscopy (an intimate tour of the colon and large intestine) took place long before Suddenly Senior was born in 1999. My first endoscopy (esophagus, stomach and duodenum) was over 20 years ago. Still, in the spirit of “Truth in Aging” – a promise I made at the beginning of this journey with you – I considered writing a piece on the ins and outs of probing one’s personal plumbing system. After lung cancer, colorectal cancer is the second leading cause of cancer death in the US. Diagnosed early, there’s an excellent change of survival. That’s why you too will almost certainly undergo at least one of these procedures sooner or later. Last Tuesday, I did both. Briefly, the procedures break down into three stages: Bathroom; Biopsy; and Babbling. “Bathroom” begins when you are forced to drink a gallon of a super-turbo laxative called Nulytely® ($36.89 at Walgreen’s; $30.49 at Costco), eight ounces every 15 minutes. A combination of Rotor-Rooter® and Plumber’s Helper, I started drinking mine at 5 p.m. By seven, I looked and felt like a beached blue whale, bloated and half-dead, but still “full of it” as my wife is wont to say. Then, at exactly 7:07, the floodgates opened. For the next three hours I sat in the bathroom. Just when you think you’re through, you’re not. As one veteran reader advised, at this point never, ever trust a fart. At the five-hour mark, I’d gone through a roll and a half of toilet paper and a bar of soap. Sore, I took a few quick sitz baths. This is highly recommended. By midnight, I was ready for Stage Two, which began at 7:40 the next morning at my friendly local endoscopy center. Your doctor will explain, as mine did, that the colonoscope and endoscope – the vehicles used for this bit of dark inner-exploration – are “no bigger than my finger.” Each, however, contains a camera and lights for recording, shears or wires for clipping polyps and taking biopsies, a blowtorch for cauterizing the resulting wounds, a broom to collect cells for analysis, and a kind of snow blower that dilates the area about to be examined. Fortunately, great drugs are involved. You’re in La-La Land, just where you want to be at a time like this. 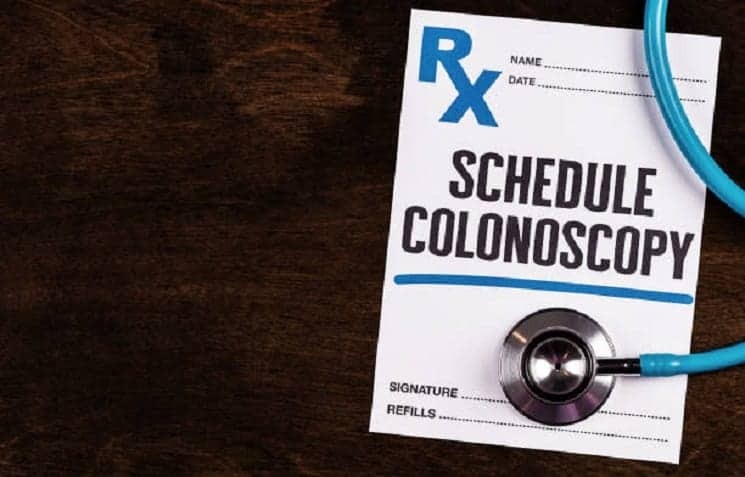 A word of caution from one Suddenly Senior reader who apparently was speaking from personal experience: Saying “I love you” to your gastroenterologist in the middle of the procedure is considered poor form and not recommended. To that, I can add the following: When you awaken into the Babbling Stage, you’ll be giddy as grandma with a winning Bingo card. You’ll be full of gas, feeling no pain, and think everything you say is hilarious. Don’t, as I did, ask everyone who comes within earshot to pull on your finger. You won’t remember, but everyone else will. The bottom line*? Do it! These procedures could save your life. And here’s a word of advice that I received too late: Unless you enjoy feeling like the world’s most prodigiously pounded human, or have no pity on those to whom you will tell your tale of inner exploration, ask your physician about a pill that can be taken instead of the gallon of laxative.